There’s a beautiful symmetry to matching simplicity with simplicity. Budweiser has just five ingredients: water, barley malt, rice, yeast, hops. A burger also just has five ingredients: bread, non-distracting vegetation, cheese, cow, condiment. The synchronicity goes beyond an ingredient label. It’s a mellifluous order -- you get alliteration, assonance, and rhythm delivered in the tightest possible command to a server: “Bring me a Bud and a burger.” It’s one of the least pretentious poetic phrases humanly possible, “baby shoes for sale” notwithstanding. If you’re in a bar, you don’t even have to say “please” after requesting the combination of Bud and a burger, because the bartender will already be grateful. That’s because even the most wildly creative cocktail bartenders love low maintenance customers who know exactly what they want. It’s not that they don’t enjoy making complicated drinks -- they make their living and their reputation off making complicated drinks -- but they sure as hell appreciate the break that merely reaching into the cooler and grabbing a bottle by the neck provides. Not having to give their opinion on “ricotta toast or chicken brochettes?” is a nice bonus. The bartender’s feelings aren’t the only personality traits this order will divine. You can tell a lot about who a person is by their reaction to “Can I get a Bud and a burger?” Do they tsk-tsk because you didn’t order a craft and didn’t get the tasting menu and everyone orders the burger? Or did they make no comment because they’re content enough with their own life decisions to not feel compelled to worry about yours? How much time do you want to spend with the former kind of person, whose sense of rightness and wrongness on beverage and meal choices extends into corrective speeches that always begin with “Actually…”? 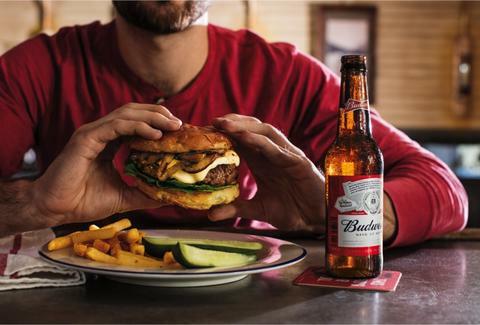 Crowd pleasing, coincidentally kismetic creation dates, and poetry aside: The magic of a Bud and a burger is consistency. You can get a Bud from Kenosha to Kyoto and it will taste exactly the same. If you’re not talking fancy burgers, you know the basic flavor game you’re walking into. The whole point of “Bud and a burger” is that you don’t have to make a single decision beyond “I’m going to drink a Bud and eat a burger.” Before the words leave your mouth you know exactly what you’re ordering will taste like, because in the end you’re really eating and drinking fond memories of having done this a hundred times before. And damn if memories don’t taste even better than serendipity.